I suffer from occasional acne, which can include inflamed cyst (1-2 cysts a month), whiteheads and red 'raised' bumps. I had lots of them during my puberty, but I got older and my skin changed as well as my skincare regime. Still, I have occasional local outbreaks, mainly on my cheeks and sometimes forehead. Most of you have experienced acne/pimples at some point, so you can imagine how frustrating it can be. There are some options to treat (not prevent in this case) pimples, my favorite is spot treatment with pink powders. One recent discovery are anti-acne blemish patches! The idea behind acne patches is that they treat blemishes like open wounds. If you think about it, what is the best an simplest way to treat a wound? use hydrocolloid bandage that helps the skin to heal while protection the open wound from the surrounding environment. This makes a lot of sense, in fact blemishes are inflamed 'wounds' of skin pores due to buildup of bacteria, sebum and dead skin cells. 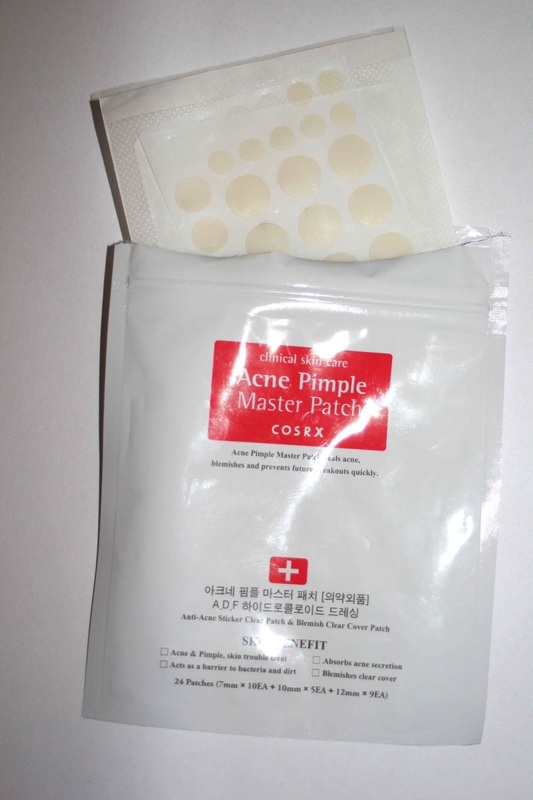 Many kbeauty brands carry this kind of acne patches, but I settled for the COSRX Acne Pimple Master Patch, as the reviews were good and I like the brand. Cosrx is a brand I really trust, ingredient wise its always simple but well formulated, without unnecessary fillers. They are famous in the AB community for their BHA and AHA exfoliating products. What the brand promises: Easy to remove spot patch protects the wounded area by absorbing the exudate and manages the environment to prevent secondary infections to minimize and heal the scarred area and to encourage faster wound recovery. For use on wounded areas, as well as after removing blackheads, emergency treatment of problematic areas, or to cover up unwanted skin problems, the patch can be used for all kinds of purposes. The patches come in a white sachet packaging with an instruction inside, the red white combination of colors is typical for the brand. COS stands for cosmetics and RX for prescriptions, I would say the packaging really has that medical prescription feeling here. The sachet has a zip lock perfect for storage, it will protect your patches and keep them hygienic. The blemish patches are glued to a sheet, there are 25 pieces in total: 9 large patches which are 12 mm, 5 medium patches of 10mm, and 10 small patches of 7 mm. I really like that there are 3 sizes to choose from, so I don't have to waste a big patch on a small pimple. You have to apply an patch on a clean dry skin area. Note this is important, no moisturizer or whatever on your skin because the patches wont stick well and fall of. The patch is more or less transparent, its not very noticeable on the skin. Sure, you can see that there is something on your skin, but its not obvious and I think much better than a red huge cyst. If I'm having a huge SOS situation then I just use one of the patches on the pimple under make up, protecting and treating it at the same time. Applying Make-up on top always makes blemishes worse, I always end up with a bigger inflamed cyst. But, not to conceal them means walking around with an ugly pimple and pink powder is pretty obvious, looks like dry flaky skin under make up. As said I like to use the patches under my make up, only when necessary (on very rare occasions). Otherwise its just after cleansing before going to bed. I find that the patches protect the blemish during sleep. So how well do they treat pimples? ...pretty good. Beware (gross!) I documented one case, you can see the picture below, the results are overnight on a really inflamed painful whitehead. The patch drained all the white 'stuff' out of the pimple, there is still some swelling afterwards. The process of healing was much faster than without a patch, the skin around the pimple was less inflamed and red than usual. I tried the patches out on different pimples, whiteheads, red bumps and forming cysts. 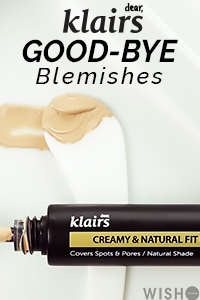 I find that they work the best when 1) if have a blemish that's forming into a whitehead - patch accelerates whitehead formation 2) if you have a formed whitehead - patch drains blemish 3) if you have open blemish wound - patch aids in healing. The patch drains the whitehead overnight. Sorry for the low camera quality, pictures were taken with an ipad front face camera. I really like the patches for draining whiteheads and protecting it from the outside world; dust, dirt, oil, and my hands. They seem also to help with healing and leave less scarring afterwards. 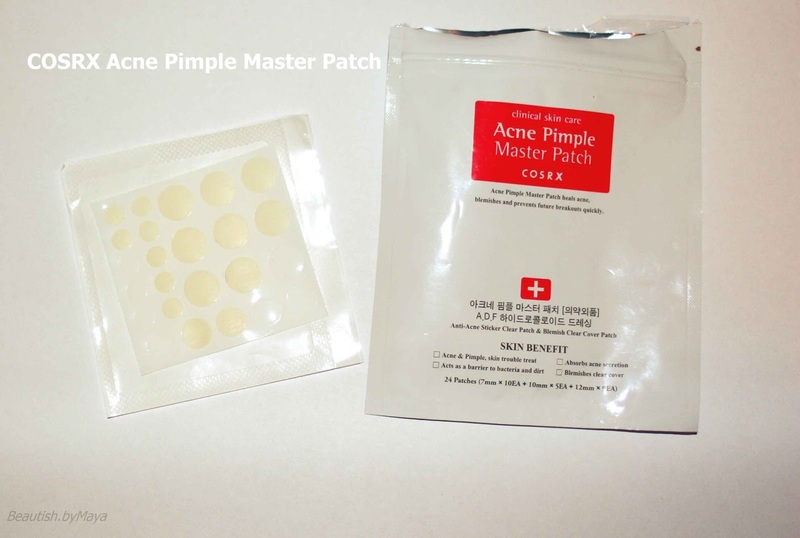 The COSRX Acne Pimple Master Patch are a nice addition to my spot treatment routine. However, the patches don't always work wonders on blemishes. I found that they were less effective on forming cyst that are red without a whitehead. In comparison to pink powders the patches don't dry out blemishes, so it can take longer for a pimple to disappear. I like to alternate between drying powders and acne patches. I purchased them at wishtrend here* for 3.90$ (tip - I like to buy a free shipping product with wishtrend to avoid shipping costs). They are also available on amazon*, memebox, and koreadepart for 5$. *This post contains some affiliate links. Shopping with them supports the blog. I've been trying this out too! I tried out a couple of other brands, and I think my favorite so far is from SkinFood because it dries my pimple better >_< Cosrx is my second favorite though! I've been trying out patches, too! I'm a picker (...urgh) and these keep me from touching my face! Innisfree makes really good ones, they actually do help calming red, closed ones! Aren't really drying them out, though. Thanks for sharing this.I have oily and pimple prone skin but thanks to these overnight acne solution products for helping me out . It is evaluated that as much as 80% of the populace Demi Moore Skin Care matured between the age of 11 and 30 will experience some type of acne. Along these lines, Visit This Link you will comprehend what should be tended to by an item so as to get you the outcomes you need.